Generally, 4 - 5 mph is the top speed for a good quality of cut. Any faster and these mowers tend not to cut or discharge properly. Although you have to take them slowly, you cut hours from your mowing time with their vast cutting width. Three reel gang mowers are the smallest with cutting widths between 4 - 5 feet. Five reel gang mowers will get the job done faster with cutting widths of 6 - 8 feet. For really large expanses of grass, seven reel gang mowers have cutting widths of more than 11 feet. Gang mowers can weigh hundreds of pounds so you need something powerful to pull them. 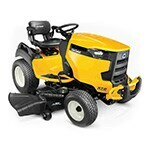 Garden tractors have large enough engines to handle the job. You can also attach a gang mower to an ATV. Gang Reel Mower Buyer's Guide - Find Out How to Pick the Perfect Gang Reel Mower. Our lawn mower how-to library can help you pick the perfect reel lawn mower, push lawn mower, riding lawn mower, zero turn lawn mower, lawn tool or lawn mower accessory.